Free Glock if you can get DeWine to sign the OGO Survey! If you want to win a FREE Glock 19 and help thousands of gun owners in Ohio in the process, please read this email now! Things are heating up in the race to become the next Governor of the state of Ohio, but they’re about to become a whole lot hotter. As we all know, Governor Kasich is on the warpath against gun owners. There are major gun-control bills on the move in the Ohio Legislature. And with each shooting tragedy, politicians increasingly look to gun-control as a way to appease the radical gun-grabbers! That’s why the person gun owners pick to be our next governor is extremely important! So far, NONE of the Democrat candidates for Governor have gone on record when it comes to your gun rights. In fact, every single one of them have supported more gun-control proposals in the wake of the Florida shooting. On the Republican ticket, however, there are only two candidates to choose from. Gubernatorial Candidate Mary Taylor boldly took the podium at the 2018 Ohio Gun Owners rally on March 10, 2018 and filled out our candidate questionnaire 100% pro-gun! That means, if elected, she’ll VETO future gun-control proposals like HB585, SB260 and others! Even more, she promises that she’ll sign into law bills like HB590, the Vitale/Keller Stand-Your-Ground bill! At a time when becoming a quisling wallflower and retreating on behalf of gun owners is in vogue, Mary Taylor is unapologetic in demonstrating her loyalty to 2nd Amendment voters. Candidate Mike DeWine REFUSES to fill out his Ohio Gun Owners candidate questionnaire. ➤➤ He refuses to say if he’ll side with Bloomberg and his militants in our General Assembly. ➤➤ He refuses to say if he’ll sign Stand-Your-Ground into law if gun owners can get it through the legislature. ➤➤ He refuses to say if he’ll veto Bloomberg’s Universal Gun Registration. ➤➤ He refuses to say if he’ll veto so-called “assault weapon bans” or hi-capacity magazine bans. ➤➤ He refuses to say if he’ll sign laws making federal gun-control laws unenforceable in the state of Ohio. Will he go to bat for gun owners? Or will he cave to the gun-grabbers? Sadly, we just don’t know. Quite frankly, his sound of silence is deafening. ➤➤ 1999: DeWine joined Dianne Feinstein and Joe Biden to cosponsor a bill “closing the gun show loophole,” which is code-words for Universal Gun Registration. ➤➤ 2005: DeWine even voted to allow lawsuits to be brought against firearms manufacturers for “gun violence” committed by criminals, which would’ve enabled organizations like the Brady Campaign to sue manufacturers out of existence. ➤➤ 2006 – DeWine partnered with Diane Feinstein, Chuck Schumer and John Warner to reestablish the Clinton Assault Weapons Ban. ➤➤ 2006 – DeWine received the first endorsement of the 2006 season by the Brady Campaign. ➤➤ 2010 – Earned an “F” rating from the NRA because of his years-long war against the 2nd Amendment. As attorney general (AG), DeWine has carefully covered the tracks he left in Congress by executing a series of moves that can easily be considered as calculated distraction maneuvers. In fact, many Statehouse insiders consider DeWine’s actions as AG to be nearly non-controversial – a bare minimum in his calculated efforts to become Kasich’s successor.necessary to appear pro-gun. Is DeWine truly pro-gun now? Or has he simply become “pro-gun” like John Kasich is “pro-gun” and only saying what he needs to say to get elected, biding his time to knife gun-owners in the back as Kasich has done? Sadly, we just don’t know, and he refuses to tell us by refusing to fill out the Ohio Gun Owners candidate questionnaire! 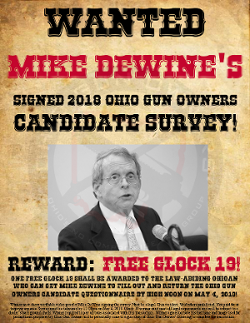 That’s why we hope YOU will help us get Mike DeWine to fill out his candidate survey – and win a FREE Glock 19 in the process! You see, Mike DeWine is running all around the state of Ohio campaigning for gun owners’ votes. We’re asking gun owners from across Ohio to print off our candidate survey for Mike DeWine, find him at a local campaign event and demand that he fill it out! You can print off our candidate survey HERE. You can monitor DeWine’s upcoming events HERE. Web, it wasn’t long ago that Mike DeWine stood with Dianne Feinstein and Chuck Schumer and supported their agenda for a gun-control America. Now that he’s running for governor, though, DeWine says he’ll stop. Which is it? And what changed? The only way we can find out is if Mike DeWine goes on record, in writing, in black and white. That’s why we’re asking you to help us get Mike DeWine to fill out his Ohio Gun Owners 2018 Gubernatorial Candidate Survey! Just print it off, take it with you to DeWine’s nearest event, and ask him to stop running away from his record and fill it out right there in front of you! IMPORTANT: in order to win a FREE Glock 19, you absolutely must have video footage of DeWine clearly filling out and signing his candidate questionnaire! The complete rules are listed below. Thank you for taking action. Gun owners have a lot at stake in the upcoming gubernatorial primary elections. P.S. Mike DeWine is running away from his record of attacks against our 2nd Amendment and refuses to come clean by signing the Ohio Gun Owners candidate questionnaire! With so much riding on the upcoming Gubernatorial primary, it is vitally important that DeWine fill out our survey BEFORE the upcoming May 8th primary – and we need your help. The first person to get Mike DeWine to fill out his survey on video so that we can document it will get a FREE Glock 19! RULES: Winner must show verifiable video proof of Mike DeWine signing the survey. Must be a legal Ohio resident. Void where prohibited. Not paid for at taxpayer expense. Survey must be delivered by 12:00pm on May 4, 2018. Glock 19 winner must meet all legal requirements and will be subject to a dealer’s background check. Winner required to pay all taxes associated with this transaction. Winner agrees to have his/her name and image used for promotional purposes by Ohio Gun Owners and to personally come to a gun shop of Ohio Gun Owners’ choosing to complete the transaction.